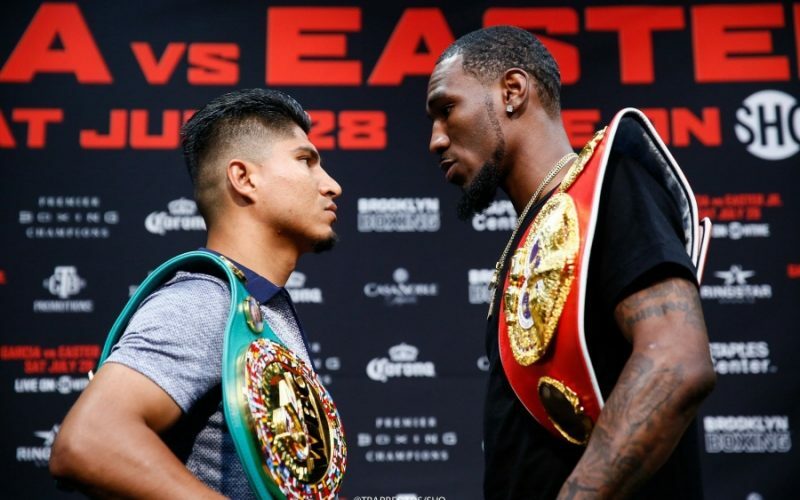 Boxing’s sanctioning bodies have finally done a service to the sport, by ordering Mikey Garcia (38-0, 30 KO) to face Robert Easter, Jr. (21-0, 14 KO) in a lightweight unification bout. In a sport consumed by networks and venture capitalists such as Eddie Hearn taking ownership over fighters and only allowing to fight against their own stable of fighters, on their platforms, we finally have top fighters being ordered to fight each other. Easter is a protege of Adrien Broner and has been frequently visible at Broner’s fights and promotional interviews in the past two years. Easter stands more to gain than Garcia should he win. For Easter is not even mentioned in talks of the best boxers pound-for-pound. The current countdown at the lightweight division is for Garcia-Vasyl Lomachenko. It appears that Mikey Garcia has been riding on a high of confidence from good sparring sessions with heavier fighters such as former welterweight Marcos Maidana. His confidence has been further solidified by his dominance over subpar competition since his return from a hiatus years ago. Riding that high, Garcia is convinced that he will overpower Lomachenko, and thus probably Easter, Jr. as well, and that he would not be undersized against IBF welterweight champion Errol Spence. Indeed, the mere fact that he is mentioning himself opposite Errol Spence suggests that he believes he can physically walk through the current lightweights. Given Mikey Garcia’s quicker hand speed, better accuracy, and the more compact delivery of his punches, Easter will have to use his height and length to keep Garcia on the outside. Moreover, Easter needs to demonstrate that he can hurt Garcia so that Garcia remembers that he is actually a lightweight, not a welterweight. A good numerical indicator as to whether or not Easter has done this effectively is the punch output of Garcia. If Garcia is kept outside, his punch output will drop and Easter can outwork him with the jab and an occasional right hand. However, I favor Garcia by stoppage as Easter has not demonstrated the ability to use his physical dimensions properly. The combined accuracy and power of Garcia would be too much to handle for twelve rounds. Garcia-Easter, Jr. airs Saturday, July 28, on Showtime at 10pm US Eastern. The IBF and WBC lightweight titles will be on the line. Mikey Garcia vs. Robert Easter Jr boxing bout preview, predictions and breakdown.